Three years in a row we update our best electric shavers list. Over 30 electric razors have been tested by our shaving experts. Top 15 has slightly changed since then, but the champion is still the same – Braun Series 7 (760cc & 790cc) is the best electric shaver for most people for years. In our most recent tests, the Series 9 has some better results, but due to its price, we gave it a Silver medal. The Bronze goes to a newcomer Norelco OneBlade. So choose whichever fits best your needs and budget. The best combination of quality, durability, functionality, and price. Tons of positive reviews, leading positions in most ratings, thousands of happy smooth-face men around the Globe. and much more features which make this electric shaver the world’s best-seller for years. 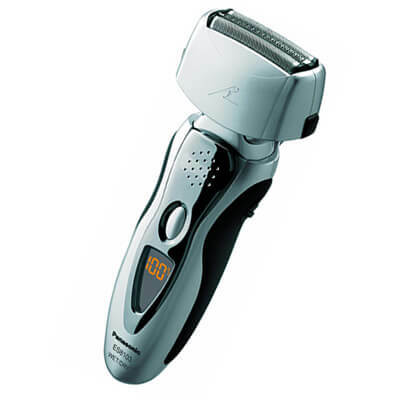 What Is Rotary Electric Shaver? What Is Foil Electric Shaver? So these are the best-selling electric shavers this year. Now let’s dive deeper into the all-time top electric razors review. Keep reading. You’re here because you’re looking for the best Braun electric shaver, right? But why Braun? It’s #1 electric shavers brand in the world, but is it worth it? Shaving and trimming is fun until you start cutting your face, and that’s to say nothing about the irritation that follows! Want to know how to avoid these altogether? We’ve got you covered. An electric shaver provides smooth shaving without pulling hair follicles, which leads to cleaner results and no cuts, but there are many cheap electric razors out there that aren’t worth it. Rest assured, however, as we’ve brought you high-quality shavers from none other than Braun, the industry-leading German brand that has been innovation the way we shave since decades ago. Braun is dedicated to innovating, and the 790cc is proof of that. This electric razor is capable of adapting to the shape of your face to trim even the hard-to-reach hair, and it takes half the amount of strokes too. Braun’s razor is designed with a 4-part shaving element, which employs 3 blades and a skin guard. It was built with efficiency in mind so it can shave and capture facial hair in a single stroke, rather than two. The head and the shaving elements are floating which allows smooth movement that adapts to your skin and captures hair in 8 different directions. The shaver is 100% waterproof and cordless. You can safely use it with running water, or even while taking a shower! The razor has a 5-setting turbo/sensitive modes to change the gentleness and power of operation, which saves battery life and provides varying degrees of precision. The shaving motor was built to deliver up to 10,000 micro-vibrations, allowing the shaving element to shear hair in every stroke without pulling, even on large beards. The charging station is unique in the sense that it cleans, lubricates, and charges your shaver. The razor comes with a cartridge to load the station, but you will have purchase more to recharge it in the future. There is no sugarcoating here, Braun 790cc is a relatively expensive shaver. While we certainly understand that high-quality is often paired with a higher price point, we can’t say this is the best solution for all. 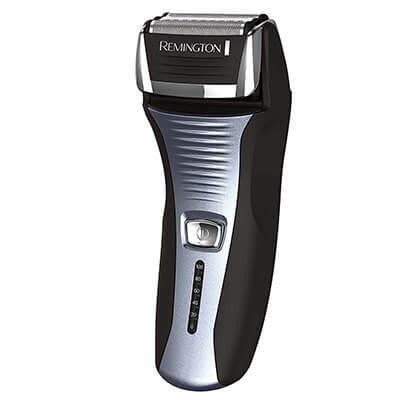 But if you are looking for high quality without the budget being an issue, definitely consider this shaver. Are you looking for professional quality and cutting-edge technology? Look no further. However, if you’d prefer the Braun quality at a lower price point, keep reading. All in all, you can get amazing results from Braun 790cc with the assurance it won’t go to the trash bin in a month or two. The performance more than makes up for the price. The Braun Series 5 shavers are regarded as the sweet spot between performance and cost. The 550cc is part of the series 5 and provides triple-action cutting to achieve close shaves without nicks or cuts. The 3-part shaving element uses 3 blades to shear hairs consistently per stroke, and it progressively gets closer to the skin to provide amazing results. The razor’s body is slightly elongated and slim, and it was designed to trim sideburns, mustaches, or full beards with ease. The unit has rubberized sides for better grip and comfort, which allows tighter control of the movement. The razor is recharged in Braun’s charging station, which cleans, charges, lubricates, and dries your shaver at the press of a button. You must purchase additional cartridges for the station. The alcohol-based solution is sanitary and scented. Braun’s OptiFoil and ActiveLift technologies work in tandem to lift, cut and capture flat-lying hair close to the skin. The rechargeable battery is optimized for quick, five-minute charging, and you can get between four and five thorough uses before having to recharge it. While not exactly in the “affordable” section, Braun 550cc is still available at a reasonable price, and the quality of the product leaves no doubts as to whether the investment it’s worthwhile or not. 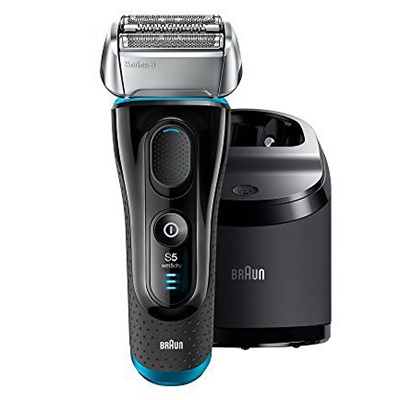 Braun 550cc has a favorable cost to value ratio, which makes it an attractive solution to those looking for a compromise between professional-grade shaving and technology. Braun’s quality rarely comes cheap, but in our opinion, this is a fair deal. 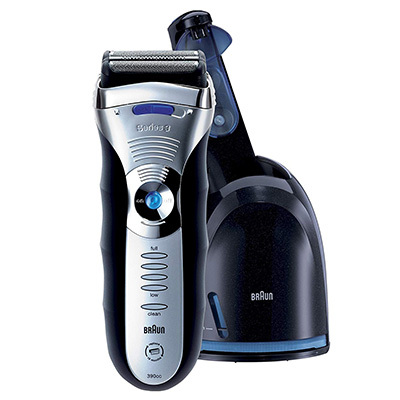 Braun 9290cc is regarded as one of the best shavers in the market. Now, making such a claim would be a bit too much from us, but we can say with certainty that this is by far the most technologically advanced electric razor. 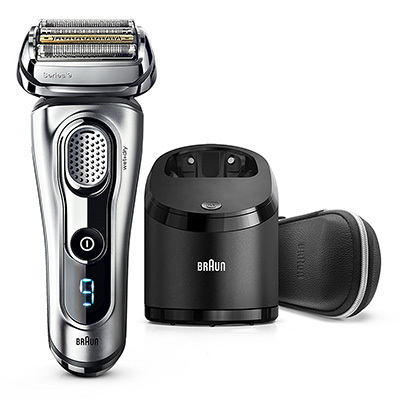 This Braun electric razor is designed with a 5-part shaving head, which employs 4 blades and a skin guard. Altogether, they shear hairs quickly with each stroke without generating discomfort in the skin. The shaving head is flexible and moves in 10 different directions to adapt to the skin. The independent floating cutting elements can capture even the trickiest hairs. Trimming is made easier with 2 trimmers, including a titanium-coated trimmer to deal with large or curly beards. Size 7 is appropriate for the sides, while size 9 is better for general shaving. The 9290cc is waterproof and cordless so you can use it with running or water, or while showering. It’s just as good for dry shaving, in case you fancy that route. The shaving motor can deliver up to 10,000 micro-vibrations to shear hair in every stroke without pulling. This gets rid of the nicks and cuts, even on large beards. The charging station cleans, lubricates, and charges your razor. The shaver comes with a cartridge of the sanitary solution, and you will need to purchase more to recharge it in the future. Braun The 9290cc is on the expensive end, more so than the previous models. The quality of the product is undeniable, but the price might be too steep for some. This is a product for the stylish perfectionist, looking for the highest degree of performance. Braun outdid itself in terms of performance with the Series 9, not so much in costs. The results you can get from this electric shaver are more than refined, but they come at a high price. Cost-prohibitive as it may be for some, this unit appeals to the prospective consumer who seeks symmetrical and stylish looks. All in all, the investment wouldn’t go to waste, as you can expect several years of mileage out of this piece. Braun Series 3 shavers might not be as popular as they were, especially considering the newer series. However, the series 3 has high-quality razors, such as the 390cc. It won’t be as flashy or technically-superior as the Series 7 or 9, but it serves its purpose well enough. Shaving head has independent floating cutting elements for better adaptability to your skin. It makes use of triple-action cutting to shave with precision, and without pulling hair follicles. Compact sized and comfortable grip, which makes it a decent travel razor. Each stroke of the 3-part shaving elements shears hair, progressively getting closer to the skin. Uses Braun’s SmartFoil to capture hair more efficiently and in different directions. Agreeable price and above average performance. This is what we call a deal! Granted, it might have a few shortcomings, such as a lower battery life or slower shaving, but altogether, you get all of Braun’s quality and performance for an affordable price. An excellent electric shaver. It will suit just about anyone, from those looking to save money to those looking for a stylish, refined look. It might still come as a bit expensive for some, but that is precisely the best part about this unit: it provides you with a healthy balance of quality versus cost. The most balanced option wouldn’t be other than a Braun Series 5, such as the 5190cc. It’s effective, affordable, and it can provide you with a close and stylish shave. If you’re looking for a quick and cheap tool to refine your looks, this might be it. The razor is designed with a 3-part shaving head, employing 2 blades and a middle trimmer to capture and shear hairs. The shaving head doesn’t rely on pressure. Instead, the head is flexible to move and adapt in 8 different directions. FlexMotionTec allows the razor to get closer to the skin without applying pressure. It achieves the same results without irritating the surface of the skin. High-speed motor and ActiveLift ensure fast and effective shaving, and the AutoSense technology accurately adapts the blades to match the problem areas. 100% waterproof and cordless, so you can use it with running water, or even in the shower. The recharging, cleaning, and lubricating is done in the charging station. The razor comes with an alcohol-based sanitizer cartridge, but you will need to purchase more to recharge it in the future. The 5190cc might just be the razor with the best cost to value ratio. Its performance is comparable to the Series 7 shavers while being on a cheaper category. It won’t satisfy the most demanding consumers, but the cost and quality are enough to warrant a thought over it. This razor is, generally speaking, a good fit for everyone. It delivers a close enough shave that doesn’t irritate the skin, it’s affordable, and shaves rather quickly. The performance and durability of the razor ensure a long mileage, and the cost is fair for a beginner entry into the market of electric shavers. Germans are famous for their engineering, and this is why Braun has never ceased to surprise us with their every new release of electric shavers. The history of Braun electric shaver goes back to the 1950s when the very first electric shaver was introduced by Max Braun. This electric shaver consisted of precision-machined blades operated by a small electric motor. The concept of an electric machine shaving a man’s beard or mustache was new at the time – the machine was capable of shaving with the use of any water or shaving soap. This innovation changed the way men shaved, forever. There are generally two types of electric shaver blades – foil and rotary. Rotary shavers work with cyclic movements, whereas foil shavers work with sideways movements that allow maximum precision and superior control over their rotary counterparts. This is precisely why Braun focuses on and creates foil-type electric shavers. Most people prefer Braun’s products due to their solid quality and the fine engineering. The appearance of Braun electric shavers is also quite inviting as the design of their products has been influenced by the Bauhaus era. Braun has been a pioneer in introducing some of the most innovative features in their electric shavers. All of their shavers offer a high degree of performance, and to make sure that they do, Braun does not manufacture any low-end electric shavers. Some of the features that are found in numerous models of Braun electric shavers are as follows. This technology induces around 10000 micro vibrations on every stroke in order to help capture more hair. This provides a smooth, thorough and comfortable shave. The Intelligent Sonic Technology is featured in the Series 7 of Braun electric shavers. The Series 7 offers an option between Extra Sensitive, Normal and Intensive modes to ensure the finest performance according to the facial area. The pivoting shaving head is designed to adapt to facial contours so a more comfortable and smooth shave is done. Both the Series 5 and Series 7 have the pivoting shaving head for maximum comfort. The cutting elements are designed in a way that they adapt to the skin’s contours while cutting short and long hair with each stroke. This feature is integrated into Series 3, Series 5, Series 7 and Series 9 of Braun’s shaving arsenal. While they may be electric shavers, but this does not prevent them from being able to be washed completely and thoroughly; you can wash your Series 3, Series 5 and Series 7 shavers with no worries at all. You can perform full maintenance at a touch of a button in all Braun series of electric shavers. There are numerous other features that distinguish Braun electric shavers from other brands, and the reviews in this article will help you identify them. Philips OneBlade is a handy and serviceable electric shaver. It’s not as good for clean shaving, but it can excellent to give you that needed touch, edge, or trim. All without the nasty cuts. The razor is light and maneuverable. For better comfort, the grip is rubberized and textured. The shaving element is affixed to a flexible head that follows the contour of your face, allowing you to shave confidently and with precision. The cutter shears hairs with a dual protection system, which ensures your having is comfortable and not too close to the skin. OneBlade can be safely used in the shower because it’s water-resistant and cordless. You can also dry shave just fine, as there is no specification. It is recommended you recharge the battery for at least 24 hours. The shaver itself has a battery life of 45 minutes, while the average recharge should be around 8 hours. Depending on how much time you spend shaving, it can last for several months. The replacement of the blade is fairly easy, and the high quality ensures up to 4 months of effective shaving. We believe this Philips blade is a great deal. The price tag is reasonably low, and the mileage you can get from this handy grooming device is nothing to scoff at. Still, we find it inadequate for a couple of scenarios: shaving long beards or styling thoroughly. The battery life is limited, and the cutting power is not as high, so it’s more geared towards the every-day shaving, up to shaving every 4 or 5 days. Should you need anything more than that, you might wish to see into different options. This Philips electric razor is a solid choice for most. It can deal with unruly facial hairs and help you keep your face clean and tidy. You won’t shear massive beards with the OneBlade, but it can make your personal care and styling much more convenient and enjoyable. 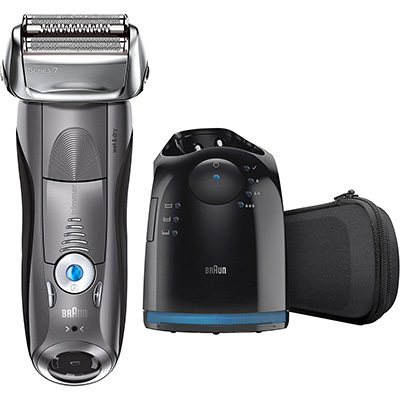 Philips Norelco 2100 is a premium electric shaver. We don’t believe you will find a razor with such a quality build at entry level, be them rotary or foil. Weighed and balanced for better grip. The razor is maneuverable enough to style and trim without hassle, although it doesn’t have a textured grip. 3-independent cutting elements in a 4-direction shaving head for an easier shaving of the neck and jawline. Extremely durable self-sharpening blades to ensure the utmost efficiency shave after shave. Replacements are a little expensive, but won’t be needed as often. You can pop the heads open with a button, allowing you to rinse the blades thoroughly. They say you can do it under the tap, but we suggest using hot water to ensure everything is cleaned. To complete your shaving, the razor has a pop-up trimmer to maintain and trim mustaches and sideburns. Though it won’t be nearly as close as an actual razor. Waterproof and cordless, so you can use them safely in the shower. Note that the device can only run in cordless mode, not while charging. Overall, it has great value. The main drawbacks are the battery time and strength of the cutting elements, but altogether the package is a nice deal. The cost is pretty reasonable, and the performance for casual, everyday usage, is brilliant. That being said, we find the overall potency of the shaver to be lacking, and that is something you should keep in mind if you have a large beard, or intend to do thorough styling. As an entry-level shaver, it’s a premium product. For its price, it does everything you need of a Philips razor, but it won’t go above that. If you’re looking for the casual daily shave, this shaver is a perfect fit, but you should definitely consider something else if your task is tougher. Following the trend of one-stop solutions for shaving and trimming, Philips brings the 4500 model. This is a slightly more sophisticated grooming device. Nothing too fancy in the outside, but it has some interesting features under the hood. The shaving head has a 3-part cutting element with pivot, flex, and float systems. This allows for a close shave that is as efficient and fast as it is gentle. The cutting elements use a dual system to shear all hairs, long and short, with an active lift and cut action. The heads are low friction and rounded for safety. The shaver follows the contour of your face thanks to its multi-directional pivot head, which is good for shaving the neck and jawline. Has a LED charge, battery low, and battery full indicator. Pretty useful to gauge how much juice is left if you’re in a hurry and can’t afford to leave with half a shave. The razor has a pop-up trimmer to maintain and trim your mustache and sideburns, although it won’t be as close as a real razor. It’s a nice tool to add a final touch after every session. Shaving head works better while wet so you can use it safely with water or in the shower. You can’t use the device while corded but a 3-minute charge should be enough for a cordless shave. It’s a bit expensive for what it does, but this electric razor should be enough to deal with tougher beards, something the previous products weren’t capable of. By no means it’s a bad deal, but as we near this price tag, something better might await. Altogether, it provides a just value, and we like this razor. Out of the Philips electric shavers we’ve reviewed so far, we find this model to be in between budget and quality. A much-needed product for those who’re looking for a mild compromise between both. We think it’s a great fit for those who need a tougher razor at an accessible price. Philips’ premium shavers are often worth every penny, and this is true with the 8900. We’re leaving the budget behind to review a high-quality shaver to style your facial hair with efficacy. Excellent recharge time and 2-year warranty. The shaving head utilizes a patented Contour Detect Technology so that each cutting element moves independently in 8 directions, accommodating to the curves of your face. This allows a closer and more effective shaving. The cutting elements use a precision system that collects hairs in an optimal position to cut, leading to a comfortable shave, although it takes a bit more time to get closer. The shaving head is angled and the grip of the razor is rubberized, which allows comfortable shaving with less hand stretching. Self-sharpening blades to ensure maximum efficiency day after day. Replacement blades are expensive, but you don’t have to change them as often due to the way the shaver operates. 5 built-in settings to trim, going from stubbles to short beard. The materials and shapes are arranged to prevent skin irritation, and they’re suitable for both dry and wet shave. High-quality battery charges fully in one hour and provides up to 50 minutes of shaving. Not what we’d call cheap, but certainly high-quality. If we’re being honest, there’s seldom a difference in styling potential between a $40 and a $140 shaver, but the added conveniences and durability end up paying for themselves in the long term. This model is expensive, but in our opinion, the features and parts are high-quality, and we don’t think you’d be switching to a different razor in the near future. Premium quality, sleek design, and capable mechanical components. If there’s a list of things a razor has to do, this Philips electric shaver ticks all the boxes. We really like the design, and we think the product is a good fit for most. Each Philips generation revamps the previous in almost every respect, and we couldn’t expect less from the 9700. Pricey, for sure, but with the reasons to be so. The Contour Detect Technology makes another appearance in this shaver, with an 8-directional shave head that follows the contour of your face and neck. The cutting elements employ V-Track precision blades to ensure the capture of every hair, no matter the length. It works relatively close to the skin with fewer strokes, leaving your face comfortable and irritation-free. AquaTec technology for effective wet (or dry) shaves, using gel or foam. It is recommended you go for the wet shave route, although there shouldn’t be any noticeable lost for not doing so. Self-sharpening blades to ensure quality shaving day after day as well as more durability. The replacements are expensive, but depending on your usage you might not need to do it regularly. Cleaning station cleans, dries, and lubricates your shaver automatically in an alcohol-free solution. Personal comfort settings to customize the intensity of the shave, as well as a facial cleansing brush addon to use with your preferred wash.
Digital display that shows battery level, cleaning indicator, and travel lock. Expensive but premium, however, is it really needed? The age-old argument. If you ask us objectively, it might not be worth it. Sure, the added convenience is fine, but it doesn’t do anything extraordinary, and frankly, it doesn’t do anything a model half its cost can’t. That being the said, this Philips electric shaver is not without its merits. We can’t deny the professional-grade results, the excellent design, and nifty addon. If you’re looking for premium performance, this might be it. Aesthetically, this product is not as compelling as the 8900, at least in our opinion, but it grabs everything it did and does it better, not by a long walk but still significant. We like the addon and believe this shaver could be the definitive “one-stop” solution for your facial care. Looking at it in this light, the purpose and value of the product are made evident. If you just want a nice shave, we suggest you look elsewhere, lower in the price category. The Click & Style Series is a 3 in 1 shaving toolkit that is designed to be used for shaving, styling and body groom thanks to 3 different attachable heads. You can use it as a dry shaver or use shaving cream for your own convenience. Dual Rotary Razor makes it easier to shave without getting any cuts or nicks. 5 length settings are included to adjust for the best trim. The PowerTouch series includes classic dry shavers. A GyroFlex 3D system is incorporated to provide three independently pivoting parts that follow the contours of your face. The UltraTrack shaving heads feature slots for long hair, channels for longer hairs and holes for the shortest of stubbles. AquaTec seal allows you to dry shave or wet shave with a cream or gel. 1 hour of charging allows you to use the shaver for almost 20 days. 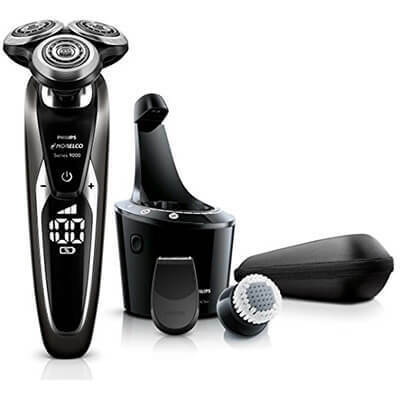 These Philips Norelco Shavers are similar to the ones in the PowerTouch series, but they have both pivoting and flexing heads, as compared to only flexing heads of the PowerTouch series. The SensoTouch 2D series is designed to offer an ultimate shaving experience and exhibit a beautiful design. They feature both pivoting and flexing heads. They can be used for both dry and wet shaving with gel and shaving foam. The skin-friendly precision timer prevents any unnecessary skin contact while trimming. 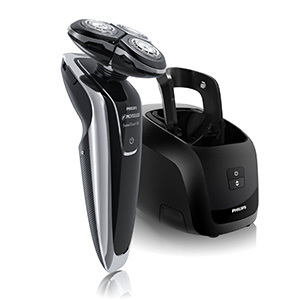 The SensoTouch 3D is the most advanced series of Philips electric shavers. This series includes both dry and wet shavers with Aquatec. The Super Lift & Cut Dual Blade System is designed to lift the hair in order to cut them from the base. The Philips Norelco AT810 Powertouch features the Aquatec technology to let you shave wet or dry as you please. So if you’re accustomed to shaving with a shaving gel or foam, this would be ideal for you. However, if you wake up one morning and realize you’ve run out of shaving cream – there’s no need to worry as you can use this dry too! The flexing heads adjust automatically to each and every contour of your face and the neck to provide an even, comfortable shave. You will only need to replace the HQ8 heads ever 12 months! The cutting heads of the Philips Norelco PT724 are rounded to provide up to 66% more comfort. The heads are designed in a way that allows them to flex and float so that your shaves are smooth and it also prevents any cuts or nicks. The pop-up trimmer is ideal for trimming the mustache and sideburns. The PT724 comes in a black-blue-white theme that gives it a really elegant look. 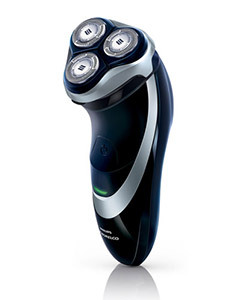 The lithium-ion battery allows the shaver to stay charged for up to 40 minutes of cordless, perfect shaving. You can now leave behind all your uncomfortable shaving experiences, thanks to the three-dimensional contouring head of the Philips Norelco 1250X. The SensoTouch series is the Philips’ top series of electric shavers and includes some of the fascinating features ever to be found in an electric shaver. For instance, the GyroFlex 3D technology ensures that the shaver follows the contours of your face and neck to give smooth shaving experience. Whereas the UltraTrack shaving heads with the Dual Precision System gives the smoothest shave imaginable. Anti-Slip grip on the shaver makes sure that it doesn’t slip while you shave. Also, it can be used for dry and wet shaving using gel or foam for your convenience. 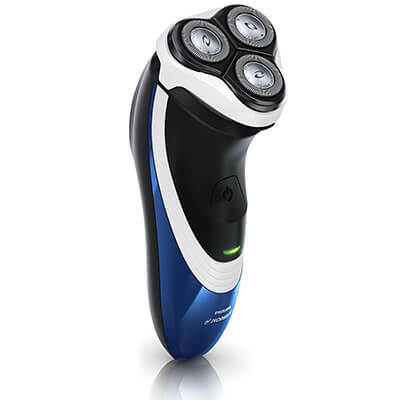 The Philips Norelco BG2040 is a unique electric shaver – it is not for shaving your beard or trimming your mustache. Rather, as its name implies, it’s designed for men who want a comfortable way of grooming below the neck. This means that the Philips Norelco BG2040 shaves and trims hair on the chest, abs, underarms, the back as well as the groin area. It is completely waterproof and you can use it while you’re in the shower, or simply as dry. The 3D pivoting head ensures that the blades follow the contours of the body as accurately as possible in order to eliminate the chances of any skin irritation. The blades and combs have been made round to prevent any scratching of the skin. A high-performance beard trimmer with 5 different length settings features to help you adjust based on the length of your body hair; a great choice for men who want to a grooming solution which prevents cuts and nicks. This is the only model currently available in Philips Click & Style series. This toolkit surely gives you a bang for your buck – providing a 3 in 1 solution for shaving, styling and body groom. You can change the heads by a simple pressing of a button. The Aquatec technology allows for a close shave regardless of whether you want to shave dry or wet with your favorite shaving gel or cream. If you want an affordable all-in-one grooming solution, this one is for you. Panasonic shavers are renowned for being high-powered and waterproof. They are suitable for both dry and wet use. This means you can either use them while taking a shower or without any water or foam at all. The best Panasonic electric shavers have been getting many positive reviews and that too for a reason. The Panasonic ES-LA93-K Arc4 truly exhibits a class of its own. 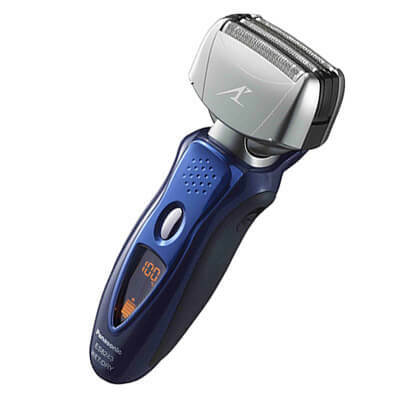 With its dual motor and multi-flex pivoting head, shaving had never been so comfortable. The powerful 14000 cycles per minute linear motor is capable of providing you with 45 minutes of usage. It requires only an hour of charging. Simply put, 45 minutes of usage time means that you will be able to use the shaver for approximately 2 weeks if you shave on a daily basis. Impressive indeed! The four foils reduce shaving time and ensure excellent coverage of your face. This shaver is ideal for the most demanding of men! 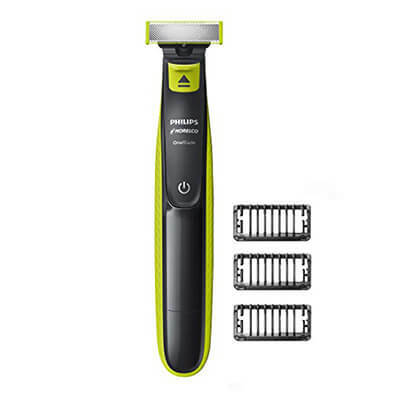 This Arc 3 (3-blade) shaver is brimming with smart features that are designed to give you the experience to remember. The three-blade shaving system ensures a smooth and comfortable shave and adjusts according to the contours of your face. The blades are angled at 30 degrees to make sure that they cut the hair at the base to provide an effortless and even shave. The slit foil makes it easy to catch long beards which are otherwise difficult to cut using other blades. The black-silver color of this shaver really gives it a premium look and you can even carry it around with you when you travel. The built-in travel lock prevents the shaver from turning on inadvertently. 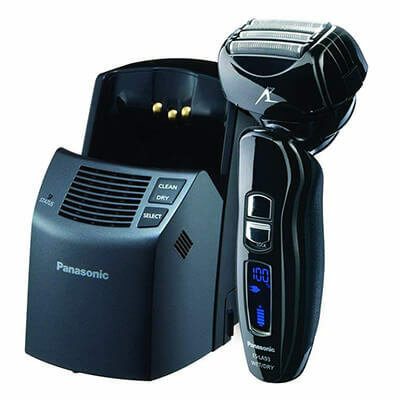 The Panasonic ES8103S is a 3-blade electric shaver that is among one of the top-selling shavers worldwide. The reason is simple enough; it is packed with innovative features that give you a wonderful shaving experience without robbing you. This shave is quite affordable too and gives you bang for your buck. The pivoting shaving head of the ES8103S brings with it a multi-fit arc foil that does a superb job of adjusting according to the contours of your face and gives a smooth, clean shave. The shaving head can also be taken apart for ease of cleaning. Other features include the nanotech blades, a pop-up trimmer, and a high-speed linear motor. Like all Panasonic electric shavers, this model is 100 percent waterproof. The Panasonic ES8243A is the older brother of the ES8103S and is equipped with 4 blades instead of 3. This blue-gray colored electric shaver is capable of being used both for a wet or a dry shave. The 4 blades ultra-thin foil cutting system working in conjunction with Panasonic’s Nano Blades give a super smooth shave with ultimate comfort. Standard electric razors operate at a speed between 8000 and 10000 RPM. 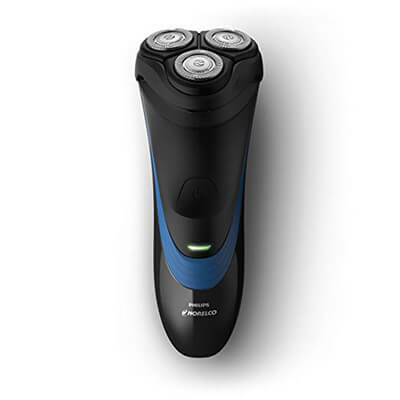 Panasonic’s rapid-fire 13000 cycles per minute linear motor is undoubtedly among one of the fastest motors ever used in an electric shaver. A faster motor means a quicker and smoother shave. Cleaning the blades is yet again almost as simple as 1-2-3. Simply remove the foil, switch on the turbo mode and rinse the blades under running water and you will make your shaver as good as new. The Panasonic ES-LV65-S electric shaver is equipped with some of the most advanced features of Panasonic’s higher class of electric shavers. The 5-blade cutting system along with the flexible pivoting head ensures that you get maximum comfort while shaving. Dab on some gel or foam if you wish, or just use it for a dry shave. 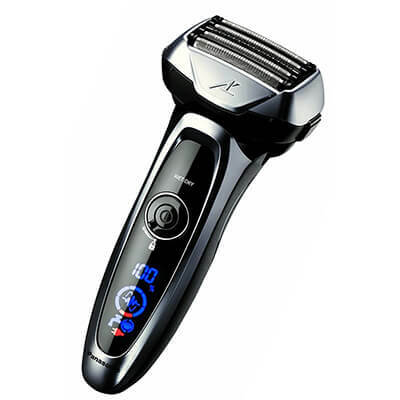 Panasonic Arc 5 shaver is also equipped with Nanotech blades to ensure that the hairs are cut at their base. Also, Shave Sensor Technology is present too. Akin to all Panasonic electric shavers, you can rinse this shaver under running water with no worries at all. This electric shaver has support for dual-voltage conversion so you can easily chuck it in your bag and take it along with you when going abroad! Wet/Dry Washable – all of Panasonic’s electric shavers are usable for a wet and a dry shave. You can use your favorite gel or foam in order to get a perfect, smooth shave. 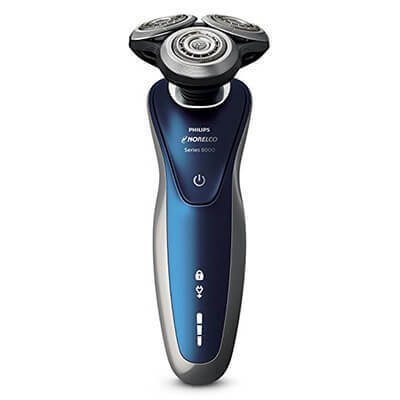 Shaving Sensor Technology – Panasonic has integrated an advanced Shaving Sensor Technology that automatically detects your beard’s density and adjusts the motor speed accordingly. 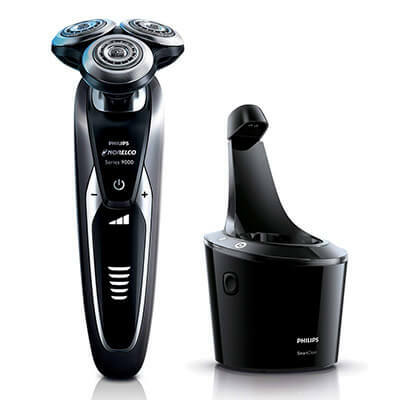 Fast, Linear Motor Drive – the motor of Panasonic’s electric shavers is a rapid-fire 13000 cycles per minute linear motor that delivers a smooth shave. Multi-Fit Arc Foil – the multi-fit arc foil follows the contours of your face to ensure an efficient and thorough coverage with maximum comfort possible. Nanotech™ Blades – the precision-designed blades 30-degree inner blades feature nanotechnology. They cut the hair at its base to ensure a smooth shave. Pop-Up Trimmer – Panasonic electric shavers come with a pop-up trimmer, which has a 45-degree angled blade to help you in grooming mustaches and sideburns. Water Shutters – the water shutters are one of a kind that allows water to freely flow through the head, allowing easy maintenance and cleaning. Sensor Mode Indicator – the blue light turns on when the beard sensor is on. Every older male needs a quality electric razor for helping him to cut through facial hair in minutes. The best electric razor for elderly man need to deal with long hair and great facial hair alike. More importantly, the razor needs to be mild on the skin. It is regrettable that every male’s skin changes with age. However every aged man should learn to adjust. Keep reading this review to learn more about five electric razor models that are ideal for older males to use. Each model is practical and easy to hold, but the features vary in between designs. Let’s find out how well these razors can work as you’re discovering a tool for your convenience and convenience. This table represents our pick of top electric shavers that fit best for old males. We compare 5 razors by two parameters. First one is the type of razor: rotary or foil. The second parameter is a run-time – this is a number of minutes or hours shaver can work from one charge to another. This shavers comparison table updates on a regular basis. Your first option originates from Braun, a popular name in the shaving world. Braun makes the Series 7 razor with a clever body that adapts to your beard. You will get a constant trim whenever you use the Series 7 shaver. The shaver consists of 4 shaving components to produce a tidy cut. There are 3 cutting tools followed by a SkinGuard surface to prevent the blades from being too rough. The control setup at the bottom consists of two buttons for switching in between five shaving modes. The 5 setups change the power setting on the motor. The little lights on the bottom list the specific shaving mode you are using. The Sonic and Autosense innovation produces 10,000 microvibrations per minute. The motor adapts to the hair’s thickness, thus capturing more hair with each stroke. The battery runs for 50 minutes on a full charge. The battery likewise charges in about an hour. The charging station includes a cleansing dock that lubricates and clears out the razor. 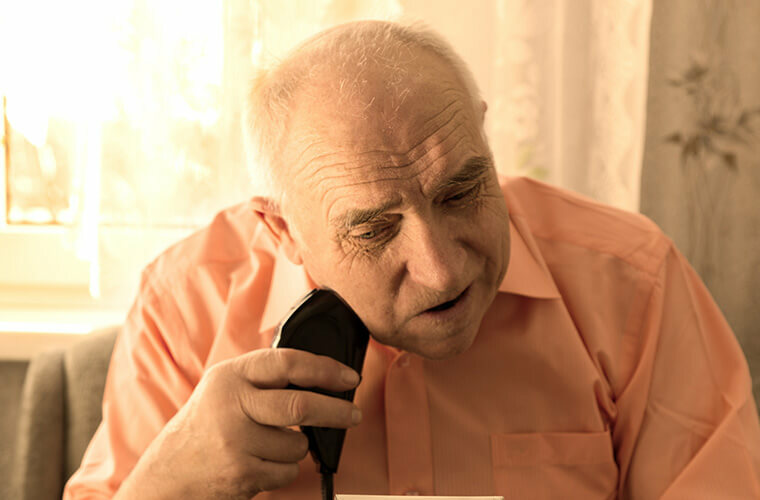 The shaver appropriates for elderly men as it uses a mild approach to cleaning out hair. The foil cutter is safe and comfortable, while the blades will not get in direct contact with the skin. I was impressed with how well the razor works. The Series 7 razor is simple to turn on and configure. I can also use this shaver in the shower. The shaver’s capability to operate in damp and dry conditions is a plus. The included accuracy trimmer is one of my favorite functions. The trimmer succeeds for spots like around my sideburns, under my nose, around my lip, and other spots that are typically hard for me to trim. The cleaning and charging station was likewise beneficial to me. 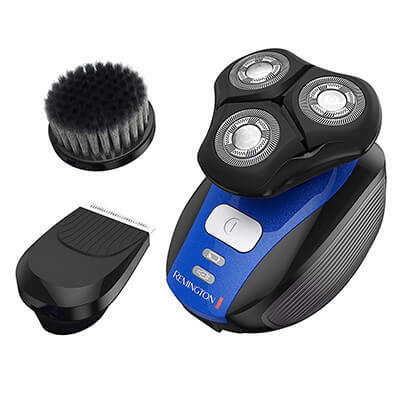 This option for the best electric shaver for elderly man is various from the others on this list due to the fact that it features a tri-head style. This consists of 3 rotary heads connected together on one body. The flexible heads provide a firm cut. The 3 shaving heads move in eight directions. The close shaving movement provides a crisp cut with a closer outcome. The ContourDetect system identifies hair and flexes the cutting heads based upon the angles the hair matures. Part of this is to raise the hair so everything is uniformly cut. The self-sharpening blades will collect your hair and tidy it out. The razor utilizes 3 shaving speeds. Choose the Slow option for a mild shave on delicate skin, a Medium setting for basic shaving needs, and a Fast shave for thicker spots. Include your face wash to the brush and turn the razor on. Utilize the brush either after you shave for a fuller clean or before to soften the hair. I can utilize a five-minute quick charge to get enough power for one shave. I likewise like how it takes an hour to charge the razor in general, however the quick charge is frequently all I require. The cleansing feature on the charging station utilizes a multi-part method that is far more extensive than what I’ve seen elsewhere. The SmartClean system cleans down the shave heads, cleans the blades, and then dries everything up. I can even get the battery charged while the razor is being wiped. I would have liked to see an accuracy trimmer on this razor. But the tri-head shape pretty much makes it difficult for the razor to have such a feature. This next option from Panasonic is ideal for elderly men for having a versatile shaving head. The head produces a company body for cutting that is easy to launch and use. 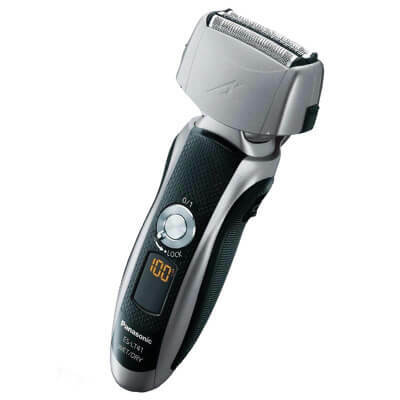 The blades within this Panasonic trimmer model offer you a tidy shave each time. The foil-based style gives you a surface for trimming your hair. The ARC4 system uses a couple of stainless-steel foils. The Micro-Fit blades are crafted by Panasonic to cut the skin around the base for a closer cut. The blades are honed at an inclined edge to produce a straight cut at the root. The hypoallergenic design offers a comfy sensation for your skin. You will not establish inflammation or irritation when using the shaver. A pop-up trimmer operates for closer spots. The device is housed on the back part of the razor head. The flexible head provides you a comfy cut along all parts of your face. The direct shaver motor offers you a cut at about 13,000 cycles per minute for a crisp cut every time. A digital screen also exposes how much power stays in your battery. You can set a timer for shaving so that you can see just how much time you require to spend with getting your cut handled right. I tried this razor out in the shower. The razor worked well and was simple to clean off. I discovered that the second razor foil is not as thick as the very first one. It appears like the foil collects the tiniest little bits of hair at the start and then goes on to the larger bits. I like this method as it pre-trims my hair and after that cuts off the extended areas. The flexible head lets me shave in either a conventional back and forth motion or in a circular pattern. The latter offers me a rotary-like feel. I noticed that the razor motor altered in intensity when I walked around the thickest bits of hair. The function worked for assisting me with getting a better cut all around. I would have liked a few power settings on this razor. I believe a slower setting for delicate spots might have worked best, especially for skin that is dry or wrinkled. One more Philips Norelco shaver in our list. Premium quality, sleek design, and capable mechanical components. If there’s a list of things a razor has to do, this Philips electric shaver ticks all the boxes. We really like the design, and we think the product is a good fit for most. You can use this Norelco razor in the shower or with shaving foam or gel. The adaptability of the razor makes it a popular choice. The razor consists of a pop-up trimmer on its side. The trimmer consists of a couple of settings for cleaning out specific little bits of facial hair. You can use the trimmer on your sideburns, around the lips, or under the nose. The trimmer produces fades and curves on your beard. You can likewise cut stubble down with the later cutting units. The sensing units inside the foils will determine the hair’s density. The quantity of power supplied to the motor is adjusted to speed up when the hair is thicker. The power decreases where the hair is lighter in strength. 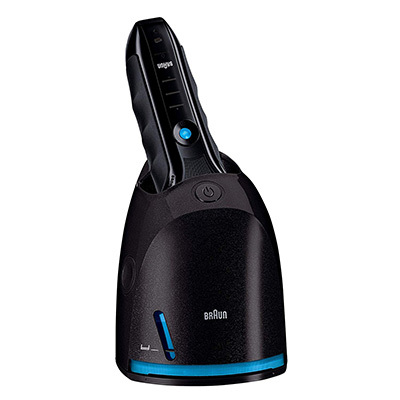 Older men will enjoy this Philips shaver as it provides a comfortable grip that is simple on the hand. Those who have arthritis or other joint problems will like this function. I tried this shaver with both shaving foam and gel. I had to clean up off the shaving head a few times, however the cleaning process didn’t take long. The razor was a little louder when I got through thicker areas around my hair. The foil covers were great at gathering my hair. The pop-up trimmer is useful, however I would have liked a couple of extra length settings to cover longer little bits of hair all around. The last in our list because of its price, but definitely deserves to be the first. Braun outdid itself in terms of performance with the Series 9, not so much in costs. The results you can get from this electric shaver are more than refined, but they come at a high price. 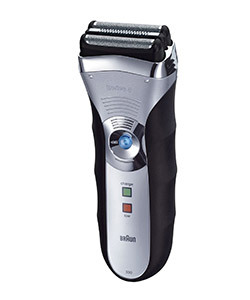 Braun makes the Series 9 razor as a durable variation of the Series 7 razor. The Series 9 is various as the design provides more shaving aspects and contour positions for every single part of your face. The razor uses five shaving components. A SkinGuard surface deals with the 4 cutting aspects on the foil shaver. The design keeps an older man’s skin from being cut while shaving. The trimmers feature a titanium coating. The surface collects and cuts through thick little bits of hair in little time. The motor produces 10,000 microvibrations per minute to take in more hair with each stroke. The head contours in 10 instructions to record more hair around your skin. The head moves well on both wet and dry skin. You might use the shaver with foam or gel if wanted. The cutting head responds well to water. It works in the shower and can be rinsed off with running water. The ability of the shaver to work in the shower is essential for old males to think about. The 50-minute battery features a digital display screen that lists when you have 9 minutes of battery time or less. The charging station helps you power up the battery in moments. The station likewise consists of a cleaning surface area for the blades. I had a simple time moving the razor along my skin. The razor moved along all parts of my face and did not decrease when I was working on my sideburns. The pivoting head helped me cover more areas around the skin. I like how the razor supplies me with a tidy and smooth cut each time I utilize it. I have actually never ever experienced any bumps or scratches when using this model. The foil surface on this razor is safe on my skin. I felt comfortable with getting the razor working. The battery doesn’t seem to run for as long as package says it does. I feel that it only works for about 40 minutes at a time. Possibly it’s because I utilize it on such much coarse hair. At the end of the day, the marketplace is overflowing with amazing electric razors. A few of them are fantastic for elderly men, but others are not. Therefore, it is pertinent to find out which features are going to be essential and which ones can be overlooked. If you do not take these factors into factor to consider, there is a likelihood that you’re going to make a horrible error and you’ll end up hating your razor. Be sure to think about the elements listed below when attempting to choose the ideal razor for your skin. A lot of elderly men want to conserve loan. It is good to get a terrific deal on your razor. There are plenty of things that can go wrong with less expensive electrical razors. The battery might die very quickly. That would lead to your hair being pulled on and that would be extremely painful. Suffice to state, it is actually in your best interest to invest a little bit more. Doing so will assist guarantee you get a better razor and better results in the long term. Again, elderly men have a great deal of unique facial functions. Their hair can in some cases be very rough and hard too. It is significant to make sure that you choose a razor that is going to offer you with a sufficient quantity of power. If this does not take place, there is a great chance that you’re going to be dealing with a lot of discomfort and suffering. Make sure that your face is safeguarded to the fullest. You can do this by purchasing a razor that has a very effective motor. In return, you’ll be given sufficient power to avoid pulls and pulls on your skin. In return, you will not have to grimace throughout the whole shave. When you’re purchasing an electric razor, you’ll require to determine whether or not you want a battery powered model. Or, would you prefer to keep the razor plugged into the wall at all times? Just remember that there are models that can be utilized with and without the cord. This is often the very best choice for people who desire optimum flexibility to decide on. There are perks with both truthfully. With the cord, you’ll never have to fret about lacking juice. With the battery, you’ll have the freedom to shave pretty much anywhere and all over. So, you require to consider your own unique choices. If you can not decide and you want maximum adaptability, you must opt for a razor that can be used with and without the cord. This will make your choice a lot easier even if you do end up investing a tad bit more. Having a battery powered razor is undoubtedly useful. Simply remember that the battery can be a problem. If the battery life is poor, you can basically guarantee that you’re going to find yourself charging regularly. This is something that you’ll want to prevent at all costs. You’ll want to select a razor with long battery life. This will make a huge distinction in the long run. It’ll assist guarantee that you constantly enough battery to end up the entire shave. It’ll likewise avoid you from getting disappointed with the razor and knocking it versus the wall. Suffice to state, getting a good battery is a must. While you’re at it, you’ll wish to make sure that the battery can be charged very quickly. Otherwise, you might find yourself sitting and waiting for 30 minutes or two before you can end up shaving. Ergonomics are much more essential than you might ever think of. It is actually a good idea to ensure that your razor features an ergonomic design. This will ensure that it is going to rest conveniently in your hands at all times. In return, you’ll never have to worry about your hands constraining up or getting aching along the way. Rather, you’ll get a comfortable, close shave and your hands will feel fantastic too! When you age, you do not wish to need to bear with the rubbish. You desire your life to be as easy and easy as possible. This is why you’ll want to make sure that your razor can be cleaned very easily. Your razor needs to not provide you any headaches whatsoever. You’ll desire to select a razor with a great cleansing station. This will make a big distinction by making it much easier for you to keep your razor tidy. The cleansing station will handle all of the complexities for you. The blades of your razor are going to be really important. You require to ensure that the blades are really sharp. Otherwise, they’re going to be tugging on your hair a lot and that is going to create a lot of pain and suffering for you. At the same time, you must think about the life expectancy of the blade. How long can it last before it needs to be replaced entirely? Ensure that the blades are long enduring. You need to also consider buying a razor that is geared up with self-sharpening blades. This implies that the blades are going to sharpen themselves when the razor in use. That can make a huge distinction. It’ll save you money and help you avoid requiring to physically alter the blades too frequently. Considering that you’re an older gentleman, you can ensure that your face has more crevices and bumps than someone who is younger. This can be an issue when you’re trying to shave your face. If you’re not cautious, the razor is going to strike one of those bumps and it is going to cut your skin especially when you are in the age. This is why it concerns make certain that you buy a razor that is geared up with a versatile head. This will ensure that the razor’s head is able to slide throughout the face smoothly. It’ll slide along the face’s shapes without triggering any issues. And, that can guarantee a more comfy shave. At the end of the day, you want to make certain that you’ve invested your loan sensibly. The best way to make certain that this occurs is by making sure that your financial investment is protected. You can do that by getting a prolonged service warranty on your razor. Some companies will provide a minimum of a 1-year guarantee. If you can get anything better than that, you need to certainly take note. A longer guarantee is generally much better. Goes wrong with the razor, you can sleep soundly knowing that the company will rectify the issue for you. First and foremost, you ought to find why anybody would have an interest in buying the best electric razor for elderly men. Elderly men have special facial features. Their face includes a great deal of unique acnes, including wrinkles. This can make it really challenging for these people to shave their face without great deals of cuts and nicks. Without the ideal razor, the process is going to be further made complex. This is why they need to purchase a great razor specifically developed for older people. It’ll make a world of difference and supply them with a closer and more comfy shave. Many of Braun Shavers Have a Charging Station. How Can I Charge While Traveling? You can use shaver’s cords on their own, without the bulky station. Another matter entirely is the outlet. Typical Braun products come with US outlets, but a foreign one might be needed, depending on your destination. Also if you travel often, consider buying a compact shaver for traveling. It’s cheap and saves a lot of space in your luggage. 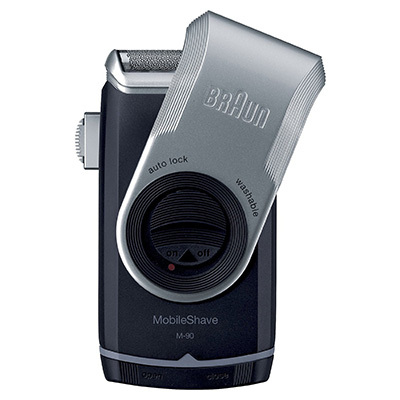 We recommend Braun M90 Mobile Electric Shaver. The Braun Mobile Shaver is the smallest shaver created by Braun. It is designed for people who are always on the move and would like to utilize their time to the maximum. The mobile shaver has a compact size and is powered by 2 AA batteries, allowing to be used at work, in the car or when commuting by other means. The wide floating foil ensures a comfortable, smooth shave and a rotatable twist cap protects the foil when not in use. Costing less than $30, this shaver is a must have for people on the go! How Often Do I Have To Change The Blades/Foils? The mileage varies with use, person, type of bristle and skin, and even the razor itself. That being said, most recommend replacing the foils once every 18 months or so. If your beard is naturally curly and you shave on a weekly basis, you might need to replace it every year or so, perhaps even sooner. On the contrary, if you shave almost daily, you might postpone a bit more. How Often Do I Have To Change The Cleaner Cartridges? The charging station should indicate you if the cartridge needs replacement, but just as it is with blades/foils, the mileage is heavily dependant on the usage. It is a good practice to remove the foil head every few days or so, tap it to remove hairs, and then put it back together. Doing so will economize the solvent. As a rule of thumb, if you can smell the scent of the solution, it should be alright, but if you’d like a hard number, 8 to 10 weeks is the bare minimum you should expect. Whenever you replace cartridges, don’t forget to rinse out the collected hair. If you let it accumulate, cleaning will take more detergent and won’t be as efficient. Are Braun Shavers Good For Black Men? There are always concerns regarded how good can a razor handle the differences in physiology when it comes to skin and hair types. Fortunately, Braun’s been known for being adequate for African-American men. This isn’t something you see explicitly mentioned in product descriptions, but according to several reviews, both from Amazon and other retailer sites, Braun razors are powerful enough to deal with all kinds of hairs or textures. For the best results, you might want to apply an aftershave moisturizer to avoid skin irritation. Can Women Use Braun Electric Shavers? Women typically use sensitive razors due to the delicate nature of their skin and the areas they shave. However, Braun shavers are designed to be used without generating discomfort or irritation in the skin, which leads to smoother results. Therefore, women should be able of shaving comfortably and reliably with a Braun electric razor just as well as with their own. Do Philips shavers offer really close shave? The “close shave” selling line is not new, but it’s not false either. These trimmers operate under the idea that a shaver should be very gentle on the skin. Of course, a manual razor will give you the closest shave, but it will also produce rashes, ingrown hairs, and other inconveniences. They provide close shaves but might require a few strokes, and even then, no, it won’t be as close as a traditional razor. How often do I have to replace the blades? Unless you grow a beard overnight, not more than 3 to 4 times per year. Different razors have different suggestions for blade replacement, but the ideal time should be once every 4 months. Self-sharpening blades are very durable and might need to be replaced less than their counterparts. In any case, each Philip electric shaver has a blade reference so that you can get blade replacements. How accurate is the battery life? It really depends on the particular battery of each shaver. Lithium-based batteries are totally different from Nickel-based batteries, but as a rule of thumb, it’s best to use the battery life to its fullest before recharging. 45 minutes of run time, for example, could take up to 8 hours of recharge. However, those 45 minutes could amount to upwards of a month in shaving, depending on your usage. In the case of some shavers, a 3-min charge is enough for a shaving session, but you need to read up the specifics. Can women use these razors? Absolutely! In fact, many women prefer these shavers over their counterparts because the shaving is gentler and leaves no traces, which is excellent for shaving the delicate parts. On that note, a shaver needs to be flexible, as they were designed to shave the face, which is fairly plain compared to other parts of the body. A popular strategy is doing the heavy work with an electric shaver and then finishing strokes with a manual razor. When it comes to choosing the right electric shaver, the choice generally boils down to two options: foil or rotary. These are the two major technologies that differentiate between the types of electric shavers. What is the difference between the two? Which one should you choose? Before a man can answer any of these questions, it is necessary to have a fair understanding of the difference between these technologies. Read on to learn more about foil and rotary electric shavers differences. Rotary shavers come installed with circular blades that spin. These blades are flexible and can retract into the housing as the shaver is moved across the contours of the face. Each of the blades on a rotary shaver rotates independently of other blades and this makes them ideal to be used on different contours of both the face and the neck. Most of the rotary electric shavers are considerably quiet in their operation and they can be easily used to shave off a longer hair. 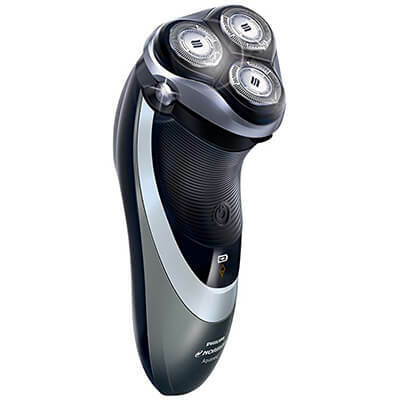 The most well-known rotary shaver brands are Philips Norelco, Remington and Hatteker. Contour Detect Technology - each shaving head independently moves in 8 directions. ComfortCut shaving system for a gentle glide across the skin and a close, comfortable shave. The innovative design allows the head to adjust to any angle, helping to provide a smooth, comfortable shave. Foil electric shavers have oscillating blades that are embedded into steel foils that are pierced. The pierced foils help by lifting up the hair for the blades, which then cut them from the base to give a smooth shave. Depending on the model, foil electric shavers generally have around 3 to 4 blades. Understandably, the greater the number of blades, the faster and smoother the shave. The top best selling foil shaver brands are Braun, Panasonic, and Remington. Close yet gentle shave without compromise. Wet-Dry Shaving. Flexible Pivoting Shaver Head. Flexibility & convenience with the ability to shave cordless. It would be unfair to declare a winner from the two competitors. Both of the electric shavers possess different qualities that are suited to different people. However, when choosing an electric shaver to purchase, you need to examine the type of skin you have, and how prone you are to irritation (sensitivity of the skin). Also, the shape of your face is a factor that you should consider when buying a shaver. If, for example, you have some pretty steep contours on your face and neck, then you may want to consider getting a rotary shaver as it is much suited for such kind of tasks. If you have sensitive skin, then you may want to try out a foil shaver to see how it works out for you. In general, a trial and error technique may need to be adopted by you as this would be the only way to find out which shaver works best for you. One of the most important parts of a man’s life is shaving – nearly as important as a couple of six-packs at the end of a working week. So, choosing the right electric shaver would be a worthwhile business as ruminations over the beer-shelves in the supermarket. The more so that you don’t buy the electric razor every day or even every week. The type of your skin, your schedule and your lifestyle in general – all these things have to be taken into consideration. And the first point of choice would be the means and methods of mechanical harvesting your face-crops. There are mainly two of them: Rotary Shavers & Foil Shavers. We recommend you to start by considering two leading brands of such shavers, Philips and Remington. And the Philips AquaTouch model is one of the best. It has a number of useful properties that will result in a neat, but comfortable, shave. First of all, it has so-called Aquatec seal – that means you can choose dry or wet shave. If you are short on time or just lazy to shave in a proper way with gel or foam or whatnot, you can shave simply while taking a shower or drinking a morning cup of coffee. DualPrecision shaving tracks, with which you get a very close shave and not cause any damage to your skin. The AquaTouch has also a QuickRinse system, the name of which speaks for itself. You can rinse your shaver right under the tap, which is very convenient indeed. The main difference between electric foil shaver and rotary shavers from the mechanical point of view is the other kind of blades’ motion. Instead of rotating, a block of parallel cutters moves to and from. This set is covered tightly with a little piece of foil made of very hard metal. There are lots of tiny holes with sharp edges in that foil, just big enough for the hair to sink into and be cut against them with a cutter. Foil shavers considered to be more suitable for people with sensitive skin. The leading manufacturers of this type of shavers are, undoubtedly, Braun, Philips, and Panasonic. If you are looking for the best shaving possible, then the Braun Series 7 shaver range could be your choice. If you have a facial hair that tends to grow in various directions, Braun Series 7 supply you with a solution to that problem. The Active Lift Technology will be in charge to lift every unruly hair up from its root and cut it neatly just at the base. Not less impressive is the range of Wet/Dry Panasonic electric foil shavers. These models are featuring Arc Blades with Nano Technology. Arc Blades mean that unlike most other models, the cutters in the cutting block stand not perpendicular to the foil, but at the angle of 30 degrees, which make hair-cutting even more close and gentle. As to the Nano Technology, well, whatever it is, the result is brilliant. The cutting head of the foil shaver usually can pivot a little to better adjust to the surface of the skin. For the same purpose cutting heads of rotary shavers can “swim” a little in their sockets. So, what electric shaver should you choose, foil or rotary? Sometimes it is very difficult to give an account for preferences in so touchy business. People make habits and are not too ready to change them even for the sake of something better. But it is also true that from time to time we want to try a new tack. If you are in that position or simply going to start electric shaving period of your life, the crucial point should be the sensitivity of your skin. In case it is prone to irritation, then opt for a foil shaver, otherwise, a rotary shaver will be a great choice too. There are men who have both types of shavers in use, the rotary one for rough growth on chin and mustache, and the foil shaver for the neck and cheeks. All of us want only the best. But “the best” when it comes to electric shavers is a thing quite individual. The best electric shaver will be the best for you and not necessarily for your neighbor or colleague. Would there be much sense in asking for their advice? So it figures out you don’t exactly know what you are looking for yet. Till you try. This is the reason why many individuals with a good consumer habit use that 30-day period during which the seller must take back an electric shaver and refund the buyer. Of course, that can give a funny thought about a bloke having all his life a good shave with a new shaver without paying a dime, but in fact, it is a dire necessity to try before you know. Really, every electric shaver demands some adjusting period, during which your skin is getting to know whether it likes the new machine spouse or it is better to file for divorce. Lots of happy men got through that procedure, and know the feeling already. Returning the shaver can be as frustrating and inconvenient but as a result… what a relief! And a readiness for a new chance. At least you will know: with that model – never again. Cross it out of your life. Anyway, some starting point is necessary. Why shouldn’t it be the Philips Norelco line of electric shavers, the part of Philips series of shavers? Many people have found this choice quite satisfactory. Norelco are rotary shavers and this brand is one of the best in its class. But if you have sensitive skin or for any other reason prefer foil shavers, then pay attention to Panasonic. They have a wide range of foil shavers that are comfortable and easy to use. The price range is from middle to high. Other deservedly famous brands are Remington and Braun. They present a variety of models that are able to satisfy every kind of tastes and wallets. All mentioned manufacturers have hundreds or thousands of positive reviews not only by advertising companies but by average consumers too. Unlike cartridge razors or safety razors with which the main bulk of shaving expenses will be stretched it time and consists in regular buying new cartridges and blades, an electric shaver is what you buy and use for years without further thoughts about shaving problem. Still, sooner or later cutting tools of your shaver will get blunt and need replacement. In most cases such parts go with the shaver when you buy it, otherwise, it isn’t a problem to buy them additionally. Some manufacturers have their own channels of distribution, so it will be a little more difficult to find their specialized shops. You also will need to order a special delivery, for which your ads they will charge you an additional dollar or two. But as a rule, you can buy what you need at any shop selling electric shavers – probably, in the same department you’ve bought your shaver. The voltage and sockets of a home electric grid aren’t the same for every country, so if you travel a lot, pay attention that your shaver has worldwide adaptability, lest your shaver becomes a useless weight after the juice is out of the battery. All kinds of adapters are on the sell too, of course. Have a great shaving and I hope this article will help you to choose the best electric shaver. Braun, Philips Norelco, and Panasonic products are, on average, among the best available in the industry, but we’ve compared each electric shaver to assess how well they fare in three key departments to determine if they deserve a spot in the list. Here we take a look at the construction and shape of the unit. Electric shavers are usually balanced, light, and maneuverable. This is an important factor when we’re talking about self-styling, as the lighter and more maneuverable a razor is, the easier you can get your desired results. This is why we’ve featured shavers with sculpted handles and rubberized sides. Some shavers have static cutting elements, and so the angle plays an important part in avoiding nicks, cuts, or irritation, but most electric razors make use of clever free-floating, independent cutting elements that work in tandem with their patented flex technologies to adapt the head to the shape of the face. Almost all of modern razors can be used both corded and uncorded, and some are waterproof to boot, catering the busy man who doesn’t have time to shave after the shower but does so while showering. Here we take a look at the settings, motor, and patented technologies. A powerful motor might be enough to shear through a lumberjack’s beard, but specialized, in-house technologies make electric shavers what they are. In addition to power, you find components that lift and capture hair, even in the trickiest places and thus cut the time we spend shaving. Another useful element is the charging station. Not many are fans of these stations, but their performance at cleaning and lubricating shavers is undeniable, not to mention the fresh scent and feel they leave in the foils. Some razors feature settings to adjust how much power is delivered to the foils, allowing you to set the cutting action to match your goals, whether they are trimming the beard or styling. Here we take a look at the cost and the value of the product. We define value as what we get in relation to what we paid for it. A razor that takes twice as long to shave your beard might not be too bad if it was dirt cheap. However, reviewed products are from the cheap end, and so we expect them to be good. That being said, it’s a well-known fact that their electric shavers aren’t inexpensive, but some offer excellent compromises between quality and cost, and they must not be overlooked. The products reviewed here bring value, and that is not to say they were cheap. Some are expensive, but their performance matches the price tag, and in some cases, such as the Braun Series 7, they offer a convenient bridge between cost and performance. Electric shavers might not be total replacements for old-school razors when it comes to close shaves, but they outdo their elders in speed and convenience, something valued by the modern man. With the market’s high stock of electric razors, a critical outlook is needed to avoid purchasing substandard products that will go straight to the trash bin after messing your face. There are countless ways an electric shaver can fail, but Braun’s history is a testimony of their dedication to the industry. We sincerely hope you can find something you can use in this list of the best electric shavers (on our opinion). But at the very least, you can make an informed decision on the matter! Do you already use electric shaver or only plan to? What’s your choice? Leave your comment below.